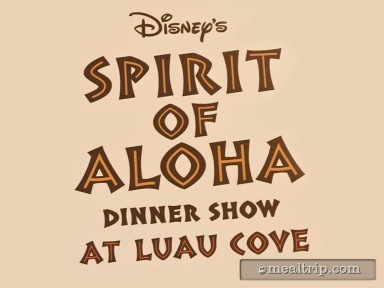 The Spirit of Aloha Dinner Show includes an all-you-care-to-enjoy tropical feast that includes mostly American-fare with dashes of the Polynesian tossed in. Starters typically include bread with bits of pineapple and coconut baked in along with a garden salad, topped with mango dressing. Items like pulled pork, ribs, roasted chicken and seasonal vegetables comprise the main part of the meal, and warm pineapple bread pudding with caramel sauce round out the meal. Beverages are included (and for adults, that also includes beer and wine). Several specialty cocktails are also available for an additional charge. The meal and show all take place in an open-air theater, so you’ll have to keep an eye on the weather. If it gets too cold (rare in Florida) or stormy (which is much more common), the "meal" usually goes on... and certain show elements may be canceled. So if you think it’s storming too hard... it’s worth checking with guest services or at the check-in location. The bookings are rarely "totally" canceled. The show itself features a live band, hula and fire dancing, comedy routines and even a little audience participation here and there. This is a very popular dining show and reservations can be made 180 days in advance. There are usually two shows per evening, but the luau does only take place five nights per week, so if you want to go, don’t wait until the last minute to book this experience. It’s not uncommon for them to be book solid for weeks in advance, especially in the summer.